The nominations for the 20th Screen Actors Guild Awards are tomorrow and we have your surefire predictions right here. Looking at the breakdown of Gold Rush Gang predictions you’ll see a lot of agreement in Outstanding Performance by a Cast in a Motion Picture. We all have the same predictions there so either we’re all good or we’ll all screwed. Like many categories, things seems to be hinging on a ‘who’s the 5th nominee?’ scenario and Outstanding Performance by a Female Actor in a Leading Role is one of them. Although most of us have Amy Adams (Big Eyes) in here she has missed out on SAG twice before, only to still manage an Oscar nomination. By the same token, Marion Cotillard has managed SAG while being snubbed at the Oscars. Her performance in Two Days, One Night has garnered a tremendous amount of traction with critics awards (as well as for The Immigrant) so hearing her name announced tomorrow would not be a surprise at all. Watch out for Hilary Swank in The Homesman, too. She’s been hitting every event and every festival possible in a one-woman tornado of a campaign that could pay off. Her random SAG nod for Conviction in 2010 is proof of that. Richard’s the breakout from the pack, choosing Swank to best Adams here. The rest of the categories see a similar scenario in which a 5th nominee separates the group’s choices. In Male Actor in a Leading Role the last spot is being reserved for either Bradley Cooper in American Sniper or David Oyelowo in Selma, depending on who you ask. With Selma not finishing in time to send out screeners it could seriously hurt Oyelowo’s chances. It has had a healthy amount of SAG screenings but that’s not quite the same. Bradley Cooper, like Amy Adams, has missed out on a SAG nom only to capture their Oscar counterpart so he’s also a question mark. Also-rans after that feature Timothy Spall in Mr. Turner and Jack O’Connell in Unbroken but neither are likely to break in. In Female Actor in a Supporting Role the race is between Laura Dern in Wild and Jessica Chastain in A Most Violent Year. Check out the full list below and don’t forget to log onto www.awardswatch.com and follow us on twitter at @awards_watch for real-time nomination announcements Thursday morning and commentary throughout the day. Ansel Elgort, star of the feature films “The Fault in Our Stars” and “Divergent,” and actress/director/producer and SAG Award® recipient Eva Longoria will reveal the 21st Annual Screen Actors Guild Awards® nominations on Wednesday, Dec. 10 at the Pacific Design Center in West Hollywood, Executive Producer Kathy Connell announced today. The nominations announcement will be telecast live on TNT and TBS at 9 a.m. (ET) / 6 a.m. (PT) and webcast live on sagawards.tntdrama.com and tbs.com. SAG-AFTRA President Ken Howard will introduce Elgort and Longoria. 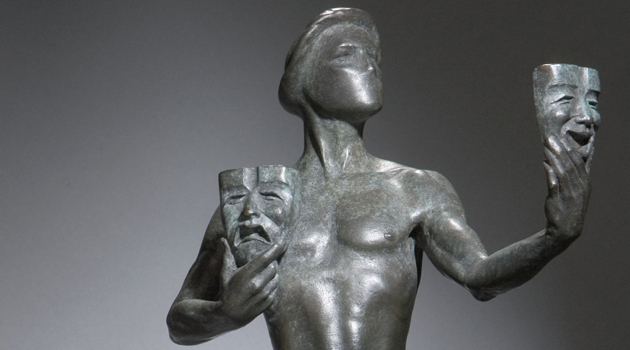 Prior to the announcement, this year’s stunt ensemble honors nominees will be announced by SAG Awards Committee Chair JoBeth Williams and Vice Chair Daryl Anderson during a live webcast on sagawards.tntdrama.com andtbs.com at 8:50 a.m. (ET) / 5:50 a.m. (PT). A talented DJ and music producer, Elgort has released the records “Unite” and “Totem” on iTunes under the moniker Ansolo. Golden Globe-nominated, Screen Actors Guild Award-winning, ALMA Award-winning actress, and Variety’s 2014 “Top 5 Actresses,” producer, director, entrepreneur, philanthropist and “Desperate Housewives” alum, Eva Longoria has made herself a trusted name both in front and behind the camera. Longoria can currently be seen guest-starring on the Golden Globe Award-winning FOX comedy “Brooklyn Nine-Nine” and will star in upcoming feature films “Refugio” (Academy Award-nominee Demian Bichir’s directorial and writing debut), “Any Day” alongside Sean Bean and Kate Walsh, and “Visions.” She has also recently starred in “Frontera” alongside Michael Pena and Ed Harris. Longoria, always incredibly committed to showcasing the diversity and potential of the Latino community, is the Executive Producer of “Devious Maids,” Lifetime’s hit one-hour dramedy that follows the trials and tribulations of five Latina women who work as maids in Beverly Hills, currently going into its third season. Additionally, Longoria is executive producer for the NCLR ALMA Awards and executive producer of the documentaries “Harvest” and “Food Chains” (both of which explore the current and historic exploitation of farm workers). She is currently producing her third documentary, “Our Time,” which explores the power of the Latino vote.